A show of solidarity with Trump ? One of the first American Football matches I watched was Superbowl XLVII in New Orleans, 2013. San Francisco 49ers -vs- Baltimore Ravens. The most exciting player on the pitch was Colin Kaepernick. A 25-year-old, 6ft 5inch flying gazelle who happens to play quarterback. This means he gets the ball a lot and can run with it. Far more entertaining than traditional quarterbacks, who just throw it. 4 years later – he’s unemployed (a ‘free agent’ in sporting terms). The biggest fall from sporting grace since Tiger Woods. So toxic is Kaepernick that no NFL owner will sign him, even as a substitute quarterback. In 2016, Kaepernick, refused to stand during the traditional singing of the US national anthem, in protest at the oppression of black people and people of colour. His actions disrespected the flag, apparently. Some say this made him NFL owners’ kryptonite. The rest is history. Last weekend, the same NFL owners who had rejected Kaepernick, linked arms with players in a ‘show of solidarity’ following Donald Trump’s goading remarks that NFL owners should fire players who disrespect the anthem and flag. Many of these NFL owners, actually contributed financially to Trump’s presidential campaign. Which poses the question – ‘a show of solidarity’ with who, or what? ! This is clear hypocrisy – but it’s nothing we don’t already know. - Sports players, no matter how good they are at their sport, can be vulnerable. However, what we don’t know is whether Kaepernick’s contract or participation agreement said anything about ‘disrespectful conduct’? Was his conduct fine-able? Where is the line between owners being able to discipline players and the rights of players to freely air their views? One thing that struck me is the need for greater contractual clarity on vaguely used terms such as ‘gross misconduct’ or ‘bringing the game into disrepute’. Well drafted contracts and disciplinary rules provide comfort to players, coaches, boards and owners. It allows sport to run smoothly, and egos to be controlled. Consider what the GAA, IRFU, or the Irish Olympic Council might do if a player ‘takes a knee’ during the singing of Amhrán na bhFiann or 'disrespects' the tricolour. In fairness to Trump, if he does one thing it’s engender debate!! 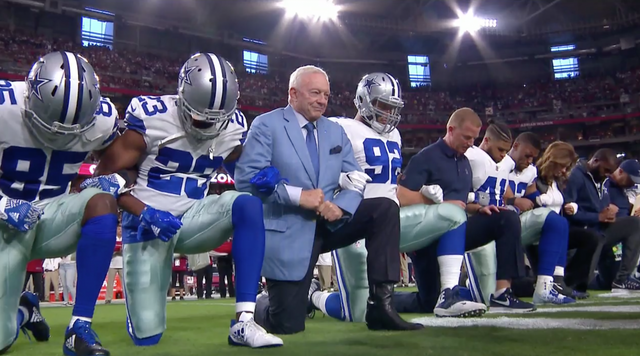 Perhaps the NFL owners were displaying a show of solidarity with him.